Starting the day right is key for being productive, but it can also help you be energetic, put you in the right mood and keep you focused ’til the evening. The best way to do that is to create a morning ritual that will help you be healthy, happy and successful in the long run. A morning routine is a set of habits done right after you wake up. It may take anywhere from a few minutes to a couple of hours. But planning your morning, coupled with filling the very first part of your day with productive, creative and healthy activities is what makes this practice so beneficial. It all begins in the evening. That’s when you make the decision to rise early the next morning, thus forming a desire that helps you to actually do it. Together with that, you take some actions to make the most of your morning when you get up. This can include writing your to-do list, getting your clothes ready, preparing your meals, and more. These steps guarantee you a great morning because you save yourself some time and worries in advance, and prepare mentally at the same time. Anything you do in the evening that’s part of the morning ritual also plays a big role in your personal organization, and makes you more productive in general. The best combination for a powerful mindset is to go to bed after you let go of anything that has happened during the day, and to wake up with a smile ready to kick start your day. Intention is important also. If you don’t know what you’ll do once you’re awake, you won’t really be motivated to do it. An even worse scenario is to leave bed only to go to work, when you actually don’t like what you do for a living. Whatever the case, you can fix that by planning your morning the night before and having a reason to wake up. Once you hear the first alarm, you’re more likely to get up. That makes you want to start the day, and over time, that makes you live more passionately and make the most out of each day. When you’re out of bed, feel good about it. You’re given 24 hours and can do anything you want with them. Appreciate this, smile about the opportunities you’ll be given later today. It can turn your whole life around. Describe your ideal lifestyle. Write about your goals and dreams. Imagine you’ve already achieved them. Draw the picture in details in your mind and put pen to paper. This type of visualization makes you focused and you can do your work with more concentration and motivation during the day, knowing you’re getting closer to the lifestyle you deserve. Many people complain that they don’t have any time to work out. But by getting up earlier, you can easily squeeze in a quick workout or even a jog. It will not only keep you in shape, but is a fantastic way to jump start your day to feel fresh and energized. Let’s dedicate some time to your spiritual health too. The morning is the only time of the day when you probably have some me time, so doing it right means you’ll be at ease for the whole day and even react with calm when unexpected things come up. Meditation is a quick and easy solution. Just find an isolated place and sit down. Start breathing deeply and focus on your breath until all random thoughts in your mind are gone. That’s when you find peace and are mindful. You can also think of a positive affirmation and repeat it to yourself while meditating to make the effect stronger and boost your motivation for the whole day. All that is enough to help even the busiest person be more organized and productive, and can lead to personal and business growth too. What other ways to kickstart a morning do you know of? If the time has come for you to delegate some of your work and finally get some help from a freelancer, there are a few important things to consider before you hire somebody. 1. What can you outsource? There are many aspects of your business you can outsource. That’s mainly the administrative and repetitive tasks that are time-wasting for you. They will be better done by someone else, simply because it’s a no brainer, and you can use that same amount of time to engage in more productive and profitable activities. Track all the things you do related to your business over the course of a few days. Add every tiny task even if it takes as little as 2 minutes. Then, analyze the data you’ve gathered. Calculate the number of hours you spend time doing things that can be delegated. The weekly number might surprise you. We often keep doing such tasks and activities unconsciously, or because it’s what we’ve always been doing or can’t leave it in someone else’s hands. But that’s how an employee thinks, not an entrepreneur. It’s time to hire a freelancer to do these for you. Watch out not to start too big – such as with delegating too big of a project to someone you barely know. You’ll regret it. Begin with a one-time project. Consider it a trial. Even if the freelancer isn’t what you’re looking for, it won’t cost you much. Plus, that’s a great way to see what kind of a person he is, how he communicates, how he deals with deadlines, whether it takes you too long to supervise him, etc. All these are what will then let you decide if he’s the right fit. 3. Work with a few people. You might be lucky and find a hard-working creative from scratch, who doesn’t charge much and works fast. And although that’s rarely the case, you should still try other people. Remember that this is a new field for you too and you need to explore it. You can’t really know all the good things a quality remote worker can do for you unless you’ve given many people a try. Some might be so intuitive and enthused about your business and doing a good job for you, that they’ll constantly contribute with ideas on how to optimize your approach even more. A portfolio can’t give you such sides from a person’s character, so you need to actually start discussing a project with him. Over time, you’ll learn exactly what you require from virtual staff, and what you can’t put up with regardless of the low price. Often, you might forget to ask a question or discuss an aspect of the project that might cost you a lot of time and resources down the road. Make sure you cover anything that might come up eventually. That means whether or not you keep the rights for the work that will be done, exactly how much you’ll pay the freelancer and when, any additional fees or contracts, deadlines, etc. Also, either write all this down just in case, or state it as clearly as possible so that you don’t need to repeat yourself over and over again. This way you’ll know how carefully the person on the other side of the screen is listening and how well he understands and follows instructions. 5. Choose the most optimal way to keep in touch. Would you like a Skype interview before you hire him for the first project? Would you want him to share what he’s working on every day and what’s left on any particular app that you’re using? Or will you need him to get familiar with an online collaboration software so that he can keep other members of the team updated? The easiest way to assess someone’s abilities is to see samples of his work that are closely related to the project you’re going to assign him. Even if they look good, you can still expect some scam, or lower quality. Don’t get discouraged, keep looking for more freelancers until you find the right one for your business goals. But still, samples, together with references, are a must to check out before you decide to work with someone. Now that you know these, hiring your first freelancer will be simpler and much easier. So, what aspect of the business do you need help with? The Internet is full of free information, and at any moment thousands of people are publishing something new. Together with that, the chances of plagiarism increase too. You put in a lot of time, creative energy, focus, money and other resources to create valuable content, to share it with people, make it look professional and encourage them to take action upon it. You don’t deserve that to be stolen by simply finding it published on another platform. However, most often we don’t even realize if that has happened. Every day, someone who doesn’t care about quality but wants to put up something on his website, might be copying an article or another piece of content of yours, and simply pasting it on his website. But that hurts your reputation and is bad for rankings (although Google is getting better and better at recognizing the original source, and understanding who’s spamming). So let’s do something about it. This is one of the leading plagiarism detection softwares, used by research institutions and millions of editors, authors, companies and individuals. You can buy credits for a single manuscript or multiple ones up to 75,000 words. There are discounts for bigger volume. This is a platform many students use, together with many institutions. It gives you instant feedback while revising. Such assessment of the work eventually helps you improve your writing skills too. That tool is completely free and instantly checks the text you type in. What’s more, you can also set up a Google alert and get notified when phrases similar to yours are being found on the Internet. Another popular option. Here you share your website url and the software checks if any part of it is plagiarized and appears elsewhere. It’s worth giving the Premium version a try. It’s said to be the most advanced plagiarism search online, and lets you check whether a piece of writing is original before you actually publish it. You can check a whole website with one action, automate the process, and see if there’s duplication within your content. A free online software that’s easy to use. Once you register, you can search 50 times a day, which is more than enough for most individuals. You can add a url, copy-paste something you want to check, or upload a text file. Website owners might find this one pretty useful as it lets you scan your entire site. It’s still free and requires an account. Want something that covers almost any language and which you can use offline too? Plagiarisma works with Windows, Android and BlackBerry, as well as online. If you need a quick search, that’s the tool for you. Simply copy-paste the text you want checked and get an instant result. Other features, like the ability to upload files, perform a deep search, or else, are paid. Now you have the right tools to make sure you’re aware of the originality of your content. No one else should be using it without your permission. But the responsibility to constantly monitor that is only yours. So add that to all the other things you’re tracking about your business. Womeneurs, mark your calendars, tell your friends and colleagues and act fast because tickets will sell out! 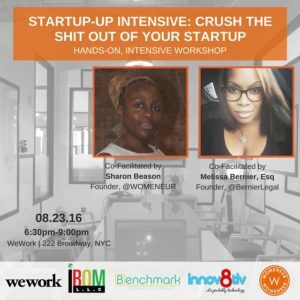 This Summer and Fall, our founder, Sharon will be dropping her knowledge from the West Coast to the South and back again to her hometown of New York City. With 10 years of holistic business savvy knowledge, Beason founded her first successful company in 2006. Since then she founded two more successful businesses before launching Womeneur in April 2015. 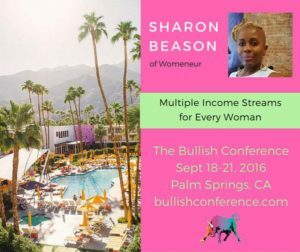 Sharon knows what it takes to collaborate, partner and foster relations with other business owners, has grown a loyal, engaging Womeneur tribe on Instagram of nearly 60K followers in months, knows what it takes to launch, operate and grow a business and began profiting Womeneur within 7 months. Womeneur has been featured as of the top 10 Instagram accounts that breathes life into your career by She Leads Africa and she was featured twice in Black Enterprise – as well as New York Times and the Daily News. If you’ve been following and supporting Womeneur, then now is your chance to hear, meet and see in person the very woman who motivates, educates and inspires you daily. Attendees can look forward to three days of networking, speaking engagements and small group seminars. 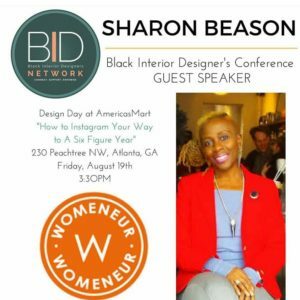 This event will pair potential designers with the tools and inspiration to get started on their own interior design projects and get their businesses off the ground. Education is the theme of this year’s conference and we’re bringing in experts in critical areas so that attendees leave knowing they can put their best foot forward and move their companies in the right direction. Each year our founder, Kimberly Ward, along with our generous sponsors, carefully craft a program that invites you to experience modern design. Guests will learn from and celebrate with some of the best interior designers in the industry. The conference is an incubator for designers, developers and interior design enthusiasts to come and exchange new ideas while paying homage to those being recognized for their great works. This hands-on, workshop is limited to 10 people so you can enjoy a more welcoming, intimate setting and really get to know your peers. And… ask all the questions you want! Being a business owner is NO joke! If you’re thinking of starting a business, already starting a business or currently own one, then this hands-on workshop is for you. There are lots of key, essential steps involved with a startup. We’ve seen too many people skip over the core basics and fail to learn what it takes to successfully own and operate a business, then they fall off the map. Don’t let this be you. This course will teach you everything you need to know to successfully get on the “map” and stay there! Would you like to spend a weekend learning tips and exact methods to start a business, increase your revenue, networking with other female entrepreneurs and enjoying a little rest & relaxation? LIMITED TO 50 PARTICIPANTS ONLY! Join me and other industry experts in a weekend of business and pleasure! The bullicorns have spoken! This year — two full days of conferencing, with vacation time built in. Arrive Sunday, conference Monday and Tuesday, leave Wednesday. Fantastic weather, amazing food, gentlewomanly living by a not-too-crowded pool. Roundtable discussions, intensive sessions. A more intimate, retreat-style conference, plus tequila. 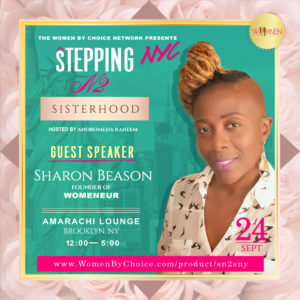 Stepping N2 Sisterhood is not just a networking and women’s empowerment event, it’s also a celebration of women as we highlight the power that women have when we support each other and work together. Join us on Saturday, September 24, 2016 from1 2 PM-5 PM for an afternoon of networking, inspiration, empowerment, and sisterhood. Each guest will enjoy a delicious plated lunch with mimosas at a beautiful upscale location in Brooklyn, NY and have the opportunity to hear and learn from successful and inspirational women who will share how they achieved success in both the corporate and entrepreneurial worlds. 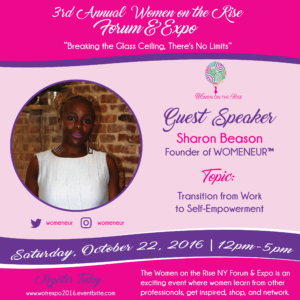 Sharon’s Topic: Tips for being a successful entrepreneur and the importance of collaborating with other women in business. Get ready for an amazing day filled with experts in marketing, finance, health and wellness, and coaching along with exhibits from women business owners to showcase their products and services. The one-day event runs from 12:00 p.m. to 5:00 p.m. including registration, speakers, networking breakout sessions, exhibits, and refreshments. Harlem Tech Week (HTW) is NYC’s largest diverse tech community conference. HTW conference, expo supports under-resourced small businesses and entrepreneurs to excel and succeed in tech.